The Solution: National Agricultural Development Company was the first agricultural company to adopt the Super High Density Olive technology, pioneered in Saudi Arabia by Middle East Agricultural Company. Jouf Agriculture Development Company followed, as did Watania Agriculture Company, and since then more than 3 million olive trees have been planted. MEAC introduced the technology for olive oil production as a strategic sustainable agriculture solution due to its efficient utilisation of water resources. This technology is fully aligned with the Kingdom’s strategy and related initiatives to encourage agriculture solutions that save water, encourage manpower efficiency, and ensure higher water productivity. 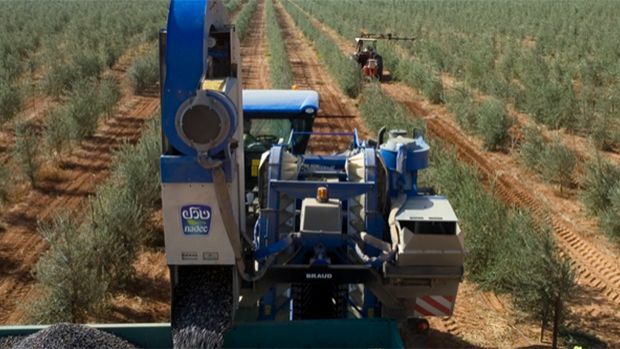 The Super High Density Olive technology was developed by MEAC’s strategic partner, Agromillora of Spain. It involves planting olive trees at high density like grapevines to allow for mechanical harvesting, and yields 1,500 plants per hectare compared to just 220 in the case of traditional olive plantations. As a result, as much as 80 percent of the water used by other olive oil extraction technologies is saved, while mechanical harvesting reduces 95 percent of the manpower required in traditional plantations and thereby eliminates the challenge of procuring unskilled labour resources. The technology also enables annual production, instead of alternate year production in the case of traditional plantations. The gross income to farmers and investors is therefore multiplied eightfold, and financial returns come from the local and global market rather than from the government (which is the case for wheat).